Some people don’t believe in magic. But that’s until they see their first breathtaking sunrise light show. Photographers believe in magic and sunrise landscape is a way to deliver it, to share it with others. Because when you share something great, it multiplies. Read further for my top 15 tips for the sunrise photography in no particular order. Side note: sunset photography is as spectacular and most of the tips apply to it too. The reason for naming is just to be concise. The difference to the sunset is not apparent on the first sight, but it does exist. There are multiple differences in several areas. First of all, it’s harder to be there in time for the sunrise. People tend to sleep at night, you know. But it’s a good thing for us, photographers! There will be nearly no people around, less noise, less distracting talks; no one walks into your frame. More often than not, you’ll have the whole area at your disposal. Whereas, during the sunset, it’s harder to build a frame without anyone in there. The other important thing here is the emotional part. The sunset transitions from light to dark, it has a soothing effect, calms us down and prepares us for the night rest. The sunrise is opposite, it transitions from darkness to light, from sleep to life. It’s like a birth of life, like a burst of energy. It feels like a new opportunity, like a new adventure. I love sunrise for this effect. The final difference is the color. Sunsets tend to be redder due to the busy day stirring particles in the air, which reflect more of the red color in the atmosphere. The sunrises tend to have more clarity in the air. With all that, I prefer sunrise photography for the tranquility it offers. Sunrise photography starts one hour before the sunrise and finishes about one hour after it, i.e. when the Golden Hour ends. Of course, seasons and sometimes locations adjust these values. In general, it is photography around dawn. During the summer, the time gap narrows, during the winter stretches and you have more time at your disposal to create a fantastic sunrise landscape. Or sunset landscape, if you want. The list of tips and tricks can be unlimited. So I’ve picked those, which are easy to follow and give you an overall picture of what’s happening when you are out for the dawn photography. Some of the tips are technical and every sunrise photo caption contains EXIF data, so read further to understand what settings to use for sunrise photography. Typically, you need to be there at least 60 minutes before the daybreak for the sunrise photography. I hear the scream “Why so early?!”. There are several reasons for that! First of all, the first faint light in the sky appears about 40 minutes before the Sun rolls over the horizon. But depending on the terrain, you may be able to see it earlier. A few months back I saw a red color in the clouds 60 minutes before the dawn. Of course, it is very dark to see anything, but your camera has an advantage of producing long exposure shots in any light. 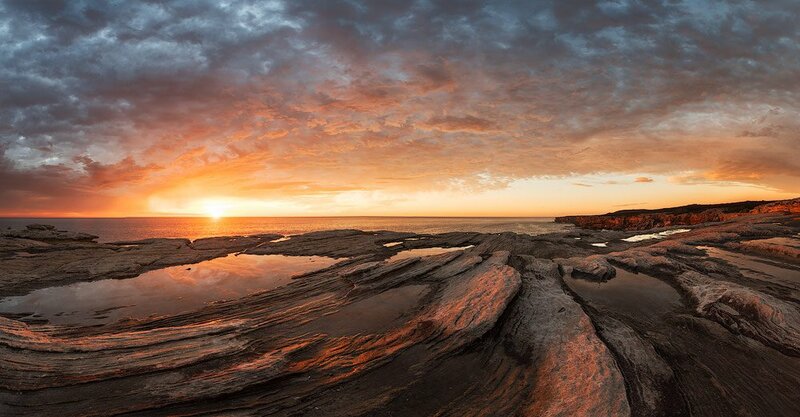 Use this time to create such surreal sunrise landscape pictures capturing the clouds movement. If shooting seascapes, you can also try many different things for the body of water. I have written a Seascape Photography Tutorial, which has some ideas on the long exposure too along with all other useful info. Check it out! For the sunrise photography settings, please use the above link too. It describes 6 types of light and timeline with all right settings for any type of photography. The other factor, which affects an early start is that you need to wander around, to feel the nature and to find some best spots. Even if you have scouted the area in the daylight, some things could have changed. For instance, the rain could have left some puddles behind or a fog shaped the terrain. 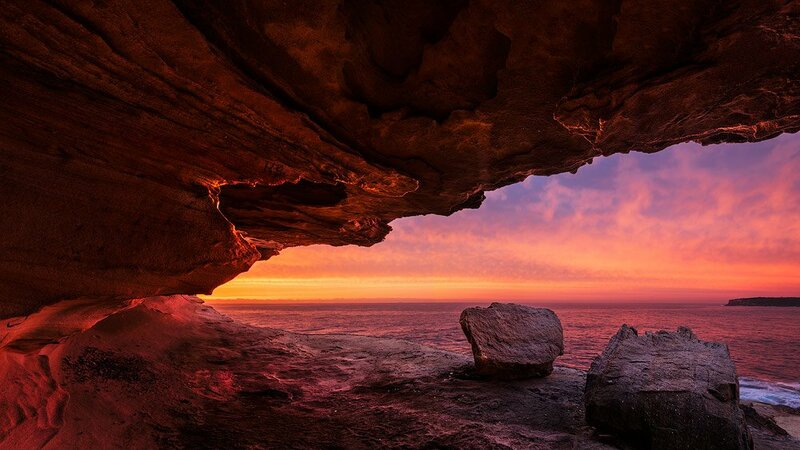 The light itself shapes the terrain and affects your future sunrise photos. The hard part of these early photos is focusing. I will cover it later in one of the tips, so read on. The need for some light may seem obvious. 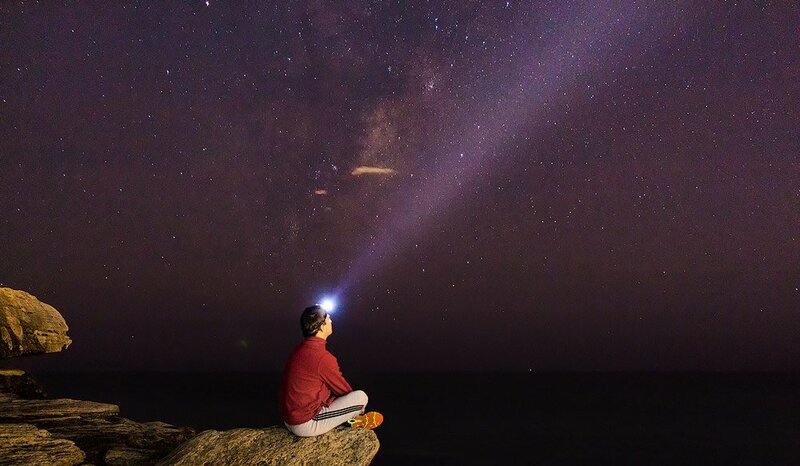 But the amount of students who come over for a sunrise workshop with a torch or a headlamp is zero. No one had it. But everyone agreed it would be beneficial to have one. So, bring a headlamp or a torch. If you hike in the mountains or some rough terrain, I’d recommend having a headlamp to keep your hands free. You may want to use a walking stick or swing a tripod to get rid of the spider webs or cast a fireball after all. On smooth terrain, you could get away with a torch. Personally, I have both and not planning to ditch one of them. Sunburst, also known as starburst effect, makes every photo way more alive and entertaining. You’ve undoubtedly seen it and probably read about it in my Starburst Tutorial article. The article has an infographic and an explanation along with a whole gallery of examples. So, read that one too. The only thing I need to add is that the starburst heavily depends on the mechanical build of the lens and will appear differently for each lens. In my experience, the wide-angle lenses produce the best stars. My Nikon 50 mm lens delivers enormous weird ultra-thin rays, so I tend to use Tamron 15-30 for this effect. So, for the starburst, we need f/16. Does it mean all smaller f-values are useless? Absolutely not! And photographers keep forgetting or even not giving it a thought. Let’s apply some common sense. When we close down an aperture, we are getting less diffraction, hence more prominent lines. On the contrary, when we open a hole, we get more diffraction and less noticeable lines. The further we go down, the less prominent effect we are getting. On f/13 we still see a pretty substantial star, same for f/9 and that gradually decreases until… Until what? It decreases until we get a warm shiny glowing light orb! Its edges go far across the darker objects near it causing an effect known as Light Bleeding. Nikon D750, Tamron 15-30. Sunrise landscape. You may need to take several shots to blend this part in. One shot for the depth of field, the other one for the light bleeding effect. It is easier to create such effect for the lower Sun position. The higher it goes, the stronger light it produces making it harder to balance our sunrise photo. The weather is our best friend. The whole art of landscape photography is about the weather and its conditions. But how can you predict a good sunset or sunrise? We need to learn to translate weather forecasts into something meaningful. I always use multiple sites to get an overall weather picture. It requires time and experiment to figure out which parameters are trustworthy for each specific weather site. I found that one place has a more accurate cloud cover forecast, the other one is better with the wind strength and direction, the third one has the best radar view. I live in Australia, and I use following sites. You may safely use half of them in your areas too. https://www.willyweather.com.au/ – swell, tide and wind. https://www.accuweather.com – cloud coverage and general forecast. http://www.skippysky.com.au/ – cloud structure and thickness. Ok, we have lots of data, but what does it all mean? Here is how I analyze the forecast. First things first, in landscape photography we look for the lovely colors in the clouds. In most cases, I would rather stay at home for anything lower than 30% coverage. Unless I’m going for a forest hike, where the sky isn’t as important and strong light works better. For the cloud coverage starting from 30% and up to around 70%, it’s safe to take your changes and wake up early. Anything above depends on the clouds location and thickness, use SkippySky for that. It might look confusing at first, but it’s so helpful that you’ll love it. High clouds are your best friends, always aim to get them. Low clouds rarely produce great colors. The best chance to get something spectacular for your sunrise photography with any clouds is to get a gap between the horizon and the clouds. But how to predict it? It’s not easy, but entirely possible. First obvious way – look out from the window and have a look if there is a gap. It worked for me a few times when East direction was visible from the balcony. The less obvious way is to use maths and SkippySky or a radar. All these factors help you understand what makes a beautiful sunrise or sunset. Nikon D750, Tamron 15-30. 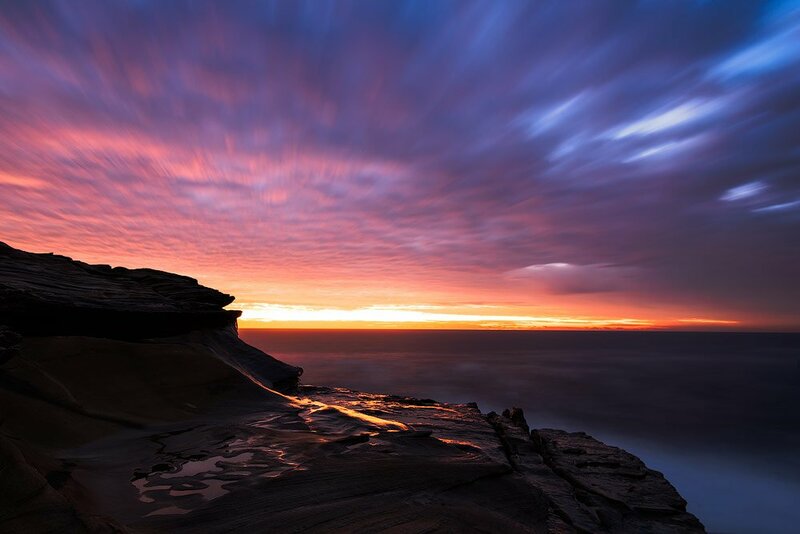 EXIF: f/16, 1/5 sec, ISO 100, 15 mm, 5 vertical sunrise photos. Open a local radar or a SkippySky app. Check the area size covered by the clouds. Refer to this horizon calculator and enter the altitude of the clouds. We can disregard the height of a human; it’s nothing to compare with the elevation of the clouds. The value you received in step 3 should be in the 60-80% of the value in step 4. You’ll need to google for the average cloud altitude like this one here, for instance. Or even better, if your local area has clouds altitude maps available online. For example, this site provides the actual altitudes. I have mentioned this before in other articles, but it’s still good advice. For the sunrise photography, as well as sunset photography, the exposure difference between the sky and the foreground is immense, and you need some tools to compensate. If you are shooting something with a flat horizon line, you can get away with the filters. Otherwise, I suggest using bracketing. This way you have better control of the final result. Please refer to the Exposing Photos Correctly section of the Seascape Guide. Nikon D750, Tamron 15-30. EXIF: f/14, 5 sec and 0.6 sec, ISO 100, 15 mm. Two shots pano, each shot with bracketing. The only addition I’d like to make is – don’t mess with HDR making programs like Photomatix. You could, however, try how Lightroom or Photoshop merges into HDR as they do it more accurately. But it’s better to learn to do it manually, either using luminosity masks or other techniques. Golden Hour is a period happening right after the Sun rises over the horizon. On average, it lasts for an hour. During winter, then the angle is flatter, it lasts longer. In summer, it lasts for 30-40 minutes at best. This type of light creates the longest shadows while keeping all the details in them. It reveals all the structure, all the textures with the warm, pleasant sun rays. Nikon D7000, Nikon 10-24. EXIF: f/9, 1/40, ISO 100, 15 mm. 11 shots pano. The shutter speed now is fast enough to shoot hand-held, but you can still use a tripod if you wish. You can still reach 1/4 of a second by manipulating f-number and ISO even without any filters, and I do recommend you to make use of the light shining through the waves or the grass blades wrapping them into the orange glow and making your sunrise photo look fascinating. Another great idea is to photograph the trees through the fog. 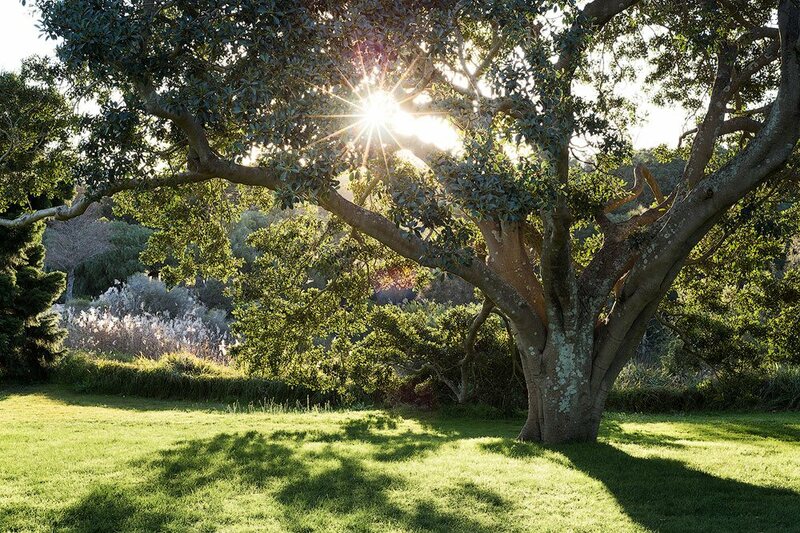 Morning light will create amazing rays beaming through the branches. One more interesting idea for the sunrise photography is to work with silhouettes. Everyone knows this, so the tip is merely a reminder. Expose for the bright background, leaving the dark object underexposed. You just need something easy to identify and with good separation from the background. Some examples would include a human, an animal, a tree, i.e., something familiar to everyone. Typically, it works better just before sunrise, while the Sun is still below the horizon. Nikon D750, Tamron 15-30. EXIF: f/14, 1/10 sec, ISO 100, 24 mm. We go to meet the sunrise and sunset because they are beautiful, right? And we always have an option to double its beauty – by utilizing the reflections. There are two types of reflections: in still water, in the busy water. The first one just copies the whatever is outside; the second one forms so-called light trails (Moon trail, Sun trail, city lights trail, etc.). Nikon D750, Tamron 15-30. EXIF: f/16, 1/5 sec, ISO 100. To get the clear reflections, you need to find some puddle, rock pool or a pond on a still morning. Sometimes you can smooth out insignificant ripples with the long exposure. The other way to get the reflections is to venture to the beach during the low tide and photograph the slowly receding water with a lot of reflections. Pro tip: after the rain, go to the rocky area. The rock platforms will hold a lot of water in the puddles bringing in new compositions and opportunities. The radiance of such pools depends on the angle of the light. Of course, the sky stays where it is but you still can manipulate this angle by choosing a lower/higher point of view. Typically, the lower point of view allows for more light to reflect (because the bright part of the sky is very low). You’ll be surprised how much radiance another 10 cm off your tripod height add. 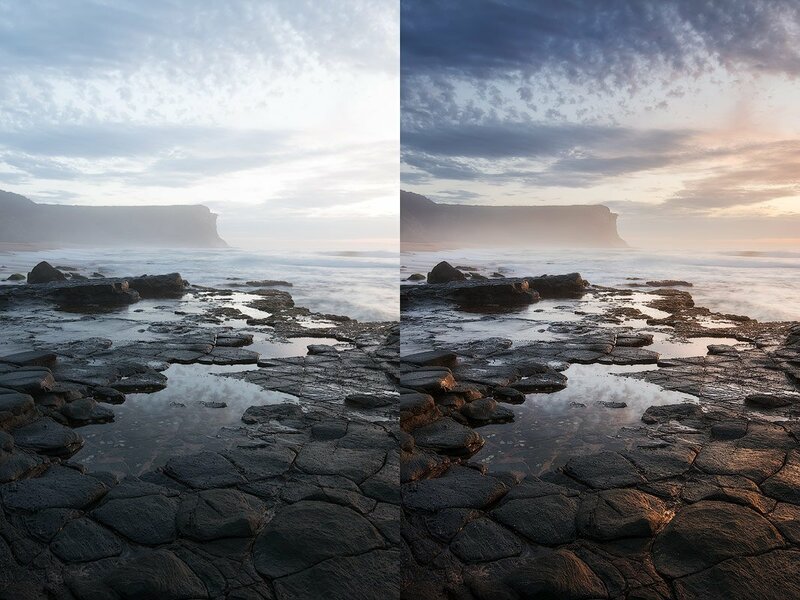 This technique works best for the sunset or sunrise landscape because of the colors and the angle. Nikon D750, Tamron 15-30. EXIF: f/11, multiple 30 sec, ISO 100, 20 mm. Several long exposures blended into an ultra long exposure. It’s hard to focus your camera in the darkness, but there are some neat tricks, which fix this issue and make it very easy to focus. Using a torch. Use a bright flashlight to lighten the nearby solid object (3+ meters away), focus on it, switch focus to manual and then shoot. Using an open aperture. If it’s not entirely dark, but your camera still struggles, open the aperture as wide as possible. This way the camera will see better. Focus anywhere, then switch to Manual Focusing and increase the f-number back to normal. You can combine this method with the torch method. We expect the best sky to be near the Sun, but it isn’t always the case. We need to look around quite often to see how everything changes. Sometimes we could see a rainbow on the West or some beautiful sky colors North of South. Don’t lock yourself into a single view, be open and flexible. Moreover, sunrise sidelight is one of the best types of light and is able to create a majestic sunrise landscape. It fills the entire scene and makes every rock and tree alive. Look for the direction where the sky is beautiful. NIkon D750, Tamron 15-30. EXIF: f/8, 30 sec, ISO 100, 15 mm. A sunrise photo overlooking North direction. The tripod tip may seem as redundant or obvious, but many starters are still not sure if they need it and keep asking questions. Yes, you need a tripod for the sunrise photography, it’s a no-brainer. It doesn’t matter how good your stabilizer is; it doesn’t matter if you are not shooting a timelapse, etc. You need it. Nikon D750, Tamron 15-30. EXIF: f/16, 0.6 sec, ISO 100, 24 mm. Spend some time getting to know your new tripod. It’s much harder to handle it in the darkness if you just bought it and never tried in the daylight. Don’t waste the precious time, use it for more extended exposures instead. The tripod type is a matter of taste. I prefer tripods with clamps, they are more stable and are less likely to fall apart. Also, I prefer the 3-D head. However, the ball heads are also OK. 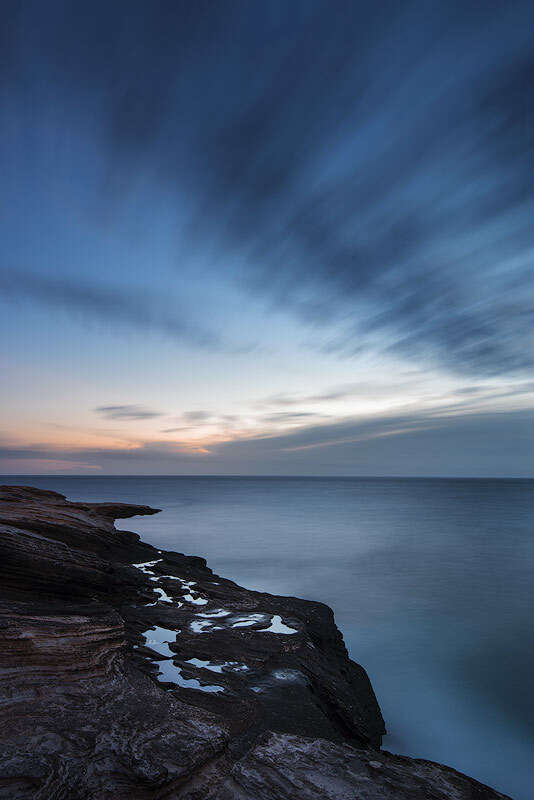 I shoot seascapes, and so I use a cheaper brand – Weifeng. It’s durable and stable and has a reasonable price. If you get a tripod, you’ll never ask what ISO to use for the sunrise – just use ISO 100 for the best quality. Do you know what kind of light is my favorite? Golden hour light? Strong side light? No and no. Most of all I like the faint skylight that becomes visible long before sunrise. An untrained eye will likely skip it, while a knowing photographer will create some unusual textures and light patterns in their sunrise photos. You need to look for the terrain features and see the faintest light. The long exposure will enhance it, and so will you during the editing. The result you can get is hard to believe. It works best for the rocks and stones or anything that doesn’t move. People get very excited during my sunrise photography workshops when I show them this type of light. Nikon D750, Tamron 15-30. EXIF: f/11, 0.8 sec, ISO 100, 27 mm. Be flexible; you can always go back if you still think the original place was better than the current one. 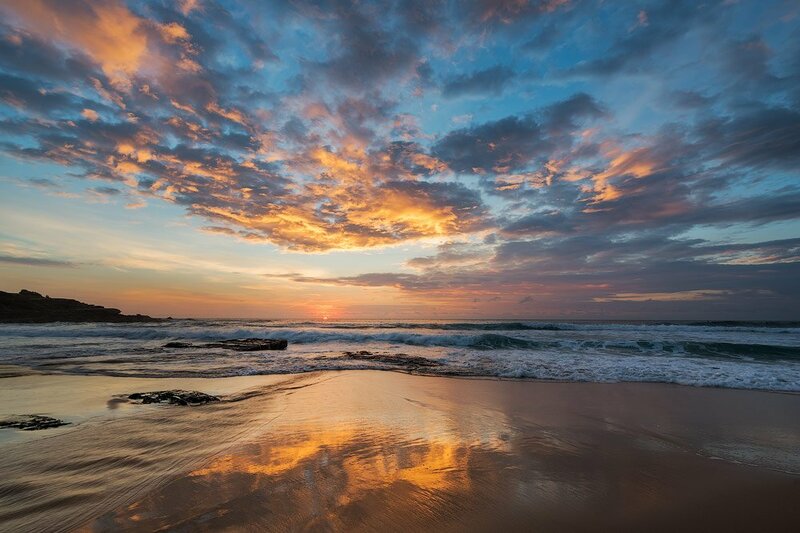 Photos from a single sunrise at the Garie Beach. And I have more to edit. The main feature of the sunrise photography is that you start early. There is no time to scout the area, and it’s also very dark. You need to know where you are going, how to get there and what are the potential best spots. There are multiple ways to research the area in advance. I would typically Google the location and browse the photos available to make decisions. Also, photography sites, which provide a location are also good – 500px and others. The best way, however, is to walk around in the daylight, take note of the potential areas and envision your future photos. This research may also affect the lenses you are going to take for the sunrise photography session. There is a little trick for the search engines. 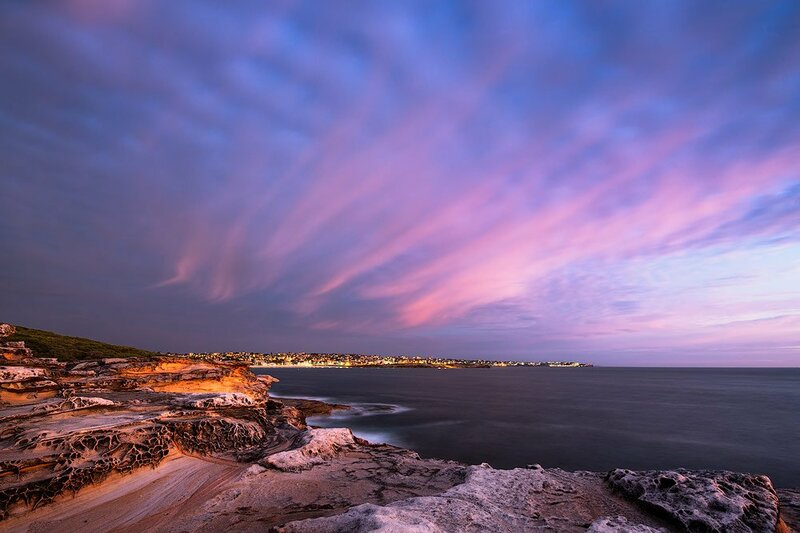 For instance, we are researching some particular place like Maroubra Beach. If you try googling it, you’ll see Wikipedia, cafes, local clubs, a map, etc. You get such results because Google doesn’t yet understand your search intent. To make it clear, add a relevant keyword at the end. 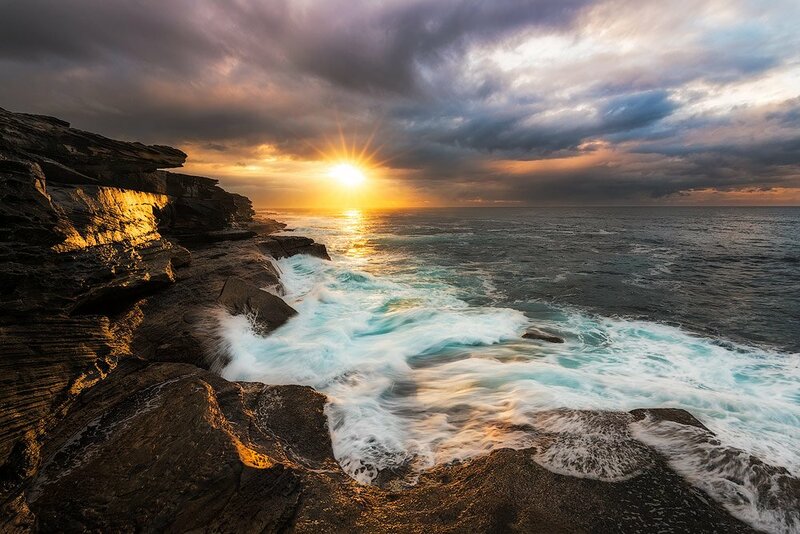 “Maroubra Beach sunrise” or “Maroubra Beach seascape.” In this case, you’ll see relevant images and most likely a photography guide I have written for the area: Maroubra Beach Photography Guide. Some keywords you may use are landscape, seascape, photography, sunrise, sunset, best spots, etc. The clouds may just fly away; they are just clouds after all. Sometimes you may witness Crepuscular rays beaming from behind the clouds. They may go both upwards and downwards. The lines they produce are great for composition and the general magical vibe of the sunrise photo. Nikon D7000, Nikon 70-300 VRII. EXIF: f/8, 1/400 sec, ISO 100, 70 mm. If the clouds are not too thick, they may still get some color when the Sun drifts precisely behind them. The colors may seem a bit dim, but you can enhance the contrast during editing. The light show may start any moment. There may be an invisible gap in the clouds, and it can turn the surroundings into something incredible. And you are after something incredible for the sunset pictures, aren’t you? Anyway, just give Nature a chance! I hope you enjoyed this article as I’ve tried my best to give you the most reasonable piece of advice to follow. If you did enjoy, please spread a word by sharing on your social media or even better in your blog. Such activities motivate me to write more! Feel free to show your best sunset or sunrise pictures in the comments. hmmm, really? That’s really disappointing. I’ll see if I can get them under the photo or something like that. Thanks for the feedback. I’ve put them in the bottom right corner now. Does it fix your user experience? Anton; just want to send you a HUGE thank you for your wonderful articles and amazing photography. I love reading your articles, and I hope other photographers spend the time learning something and fine tuning their craft as much as people like yourself have done. Thanks for sharing. Hany J.
thanks, Hany. I’m happy you enjoyed it. Can answer for Richard, but the reading experience for me is now very good. Good article too! ok, great. I want the article to be easy to read. The share buttons still pop up on the photos on my android phone but I switched to laptop this morning and it is not a problem. I’m using the latest Firefox BTW. Great article, great photos. Thanks. Hi, good points and great pics. Thanks. Great tips. And I’m glad at myself that I knew at least 3 of these. I always get extra lighting whenever I do outdoor shoots because it definitely helps. The light bleeding can especially help when you are taking sunrise/sunset snaps by the cliff, for example.